Here's why you should use them and how best to make them. As the new semester begins, the faculty often have a few free minutes to discuss instructional strategies and what grading was completed over the winter break. 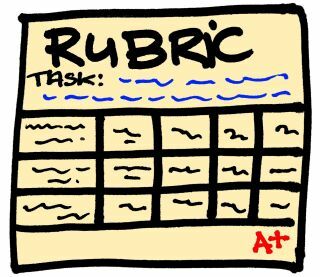 In the last week, I have heard a lot about the potential use of rubrics for a variety of reasons. Rubrics help students clearly understand the scope of the assignment and see how each facet of the assignment will be valued when it is assessed. Rubrics allow students to more effectively self-assess as well. Many instructors comment that well developed rubrics make grading assignments easier as well. Edutopia encourages using rubrics for group work to ensure all students know their role in the group. That type of rubric is generally known as a process rubric in comparison to the product rubric many are more familiar. For a ready to use presentation to share with teachers on how to utilize rubrics and rubric resources, feel free to update and/or modify my presentation now posted to SlideShare. Best of luck as the new semester begins.